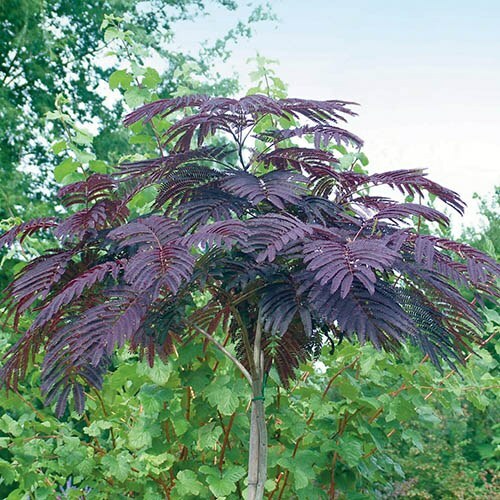 A rare and spectacular specimen tree, with amazing fern-like leaves that emerge green and fade to an incredible burgundy-purple to chocolate-brown colour in the summer sun! The colour alone makes it a unique tree, but it then produces gorgeous, fluffy pink flowers too in late-summer and into autumn! Perfect as a specimen tree in a large pot. A rare and spectacular specimen tree, with amazing fern-like leaves that emerge green and fade to an incredible burgundy-purple to chocolate-brown colour in the summer sun! The colour alone makes it a unique tree, but it then produces gorgeous, fluffy pink flowers too in late-summer and into autumn! Perfect as a specimen tree in a large pot.